Thailand's capital is Bangkok, a modern city of approximately 8.5 million people (2014). The greater city of Bangkok covers an area of over 605 square miles (1567 km²). This vibrant city offers something for everyone. No matter what your final destination is, you must spend some in Bangkok. This is a world-class city that boasts of five-star hotels and dining, luxury shopping malls and electric night life. Budget travelers can also enjoy this exotic city as it is easy to find affordable hostels, hotels and guest houses. Dine on Bangkok’s most famous cuisine, its street food, and you can eat for just a few dollars a day. If luxury shopping isn’t in the budget then visit Chatuchak Weekend Market or MBK shopping center for inexpensive clothing and souvenirs. Bangkok is a very popular vacation destination for international travelers from around the world. The city has a tremendous amount of things to see and do and one could easily spend weeks here and never get bored. 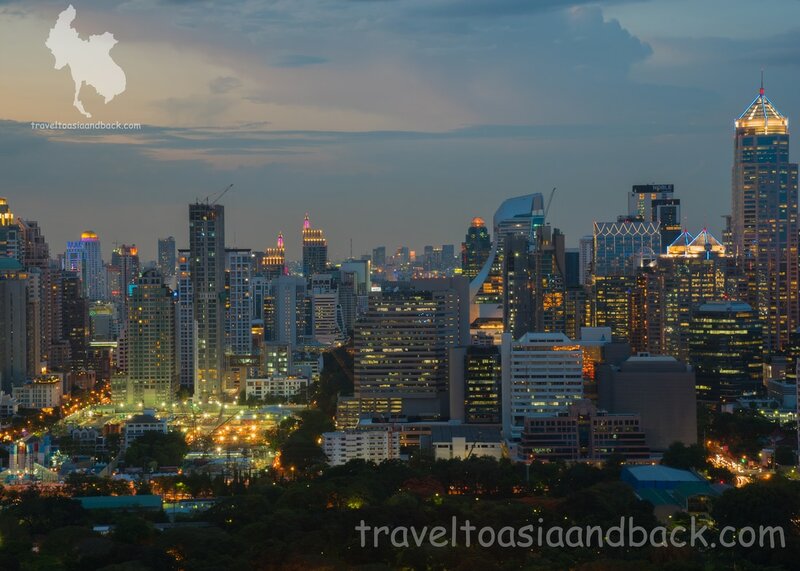 Many people do choose to spend their entire vacation in Bangkok itself, but for others Bangkok is just the beginning of a fabulous journey through Thailand and Southeast Asia. With easy access to two international airports, trains and buses, Bangkok has become the gateway city to Southeast Asia and beyond. 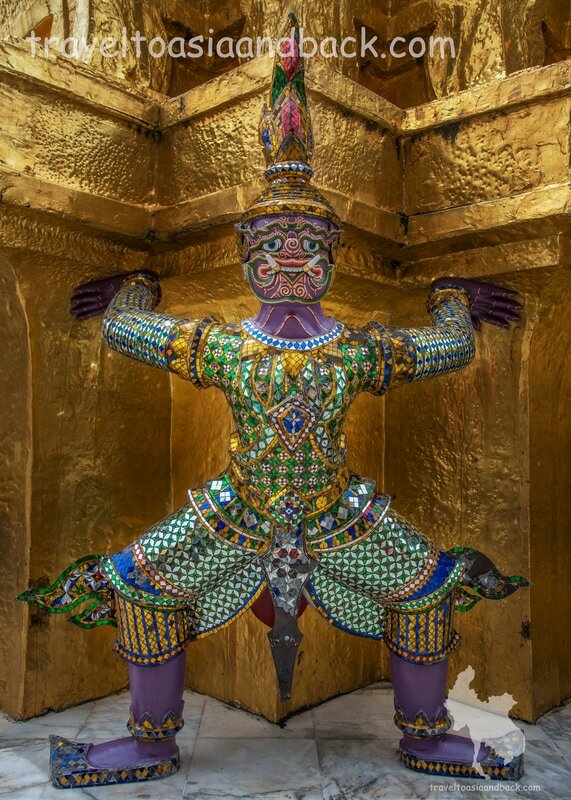 When planning a visit to Thailand, or anyplace else in Southeast Asia, many people traveling from North or South America or Europe will probably find that it’s best to fly into Bangkok’s Suvarnabhumi International Airport (BKK). Search popular airline booking websites like Skyscanner and you will undoubtedly find an abundance of convenient and economical flights from major hub cities across the globe into BKK. With well over 100 air carriers flying into Bangkok from dozens of different countries BKK is a major airline hub in its own right. Traveling from the Americas to Bangkok will take approximately 18-22 hours of flight time. Add the time it takes to check in, board and disembark the plane and you can count on a solid 30-hour journey to Asia. For this reason we strongly recommend that visitors spend the first several days of their Asian adventure in Bangkok. This fantastic city is a great place to rest and recover from long transcontinental flights. No matter where your Southeast Asian travels lead you, it’s a good idea to spend at least a night or two in Bangkok before making the flight home. This will allow for a little buffer just in case there are delays in your previous bus, train or plane journey. Although Thailand’s capital of Bangkok boasts two international airports, visitors arriving from Europe, the Middle East or North America will land at the ultramodern Suvarnabhumi (BKK) airport. Completed in 2006, Suvarnabhumi is one of the largest airports in Southeast Asia. In 2016 over 55.8 million passengers passed through it, making it one of the world’s busiest. Like most airports it is very easy to get a taxi into Bangkok’s city center. Tired world travelers will probably find that a taxi is the easiest way to reach the city. Generally the fare for the 40-minute trip is approximately 500 THB ($15 USD). However, a faster and less expensive option is to use the Airport Rail Link (ARL) which is located at the lowest level of the terminal building. Operating from 06:00 AM until midnight, these modern trains make the trip in around 30 minutes and cost no more than 45 THB. Most people will want to get off the ARL train at either Makkasan Station for the MRT metro or Phaya Thai station for the BTS Skytrain. Taxis are available at both of these stations. Buses and mini-buses (vans) are also available at BKK to reach such popular destinations as Hua Hin and Pattaya. Bangkok's Don Mueang (DMK) International Airport plays host to many of Thailand's domestic carriers. It is also a hub for discount international travel with low-cost airlines such as Air Asia and Nok Air. Inexpensive flights on Air Asia connect Bangkok with many destinations in Southeast Asia such as Phnom Penh, Hanoi, Yangon, Kula Lumpur, and Luang Prabang. For cheap transportation from DMK to Bangkok’s city center budget travelers can take either the number 1 or 2 public buses which depart frequently from in front of both terminals. Bus number 1 runs to Mo Chit BTS station where travelers can also enter the MRT metro or transfer by taxi to Mo Chit (the northern) Bus Station. Bus number two also passes by and stops at Mo Chit on its way to Victory Monument, its final destination. A word of warning: these are typical city public buses with no luggage storage and are often very crowded. Traveling on these buses with large luggage is not a good idea. Although clearing immigration is easy, there can be long lines at the counters. Travelers should bear this in mind when planning onward air travel on the same day. Depending on the time of day and frequency of inbound international flights, you should plan on spending at least one hour clearing immigration and collecting your luggage. If there is a delay in offloading the luggage or if your bags get lost, this will thus further slow the process. This is another reason why it’s a good idea to spend at least the first night resting up in Bangkok. Immediately after clearing immigration you will come across large boards listing all the incoming flights and directing passengers to the numbered baggage carousels. Duty-free shops, currency exchange kiosks and ATM machines are also found in the baggage claim area. After picking up your luggage, proceed to the exit where you will find the customs area. If you have nothing to declare, simply head for the “green” lane and exit into the arrivals area. Travelers will find more ATM machines and kiosks for currency exchange, car rental, tours and SIM cards on the arrival concourse. With plenty of English language signage visitors will be able to easily navigate their way down one level to the taxi stand or continue down to the lowest level for the Airport Rail Link. Budget travelers and backpackers will find that Bangkok is a major bus and train transportation hub. Numerous popular destinations in Thailand and around Southeast Asia can be reached safely and inexpensively from the city. Bangkok or Krungthep Station, the city’s railway hub, is most commonly called Hua Lamphong as it is only a short walk from the Hua Lamphong MRT metro station. Some of the most popular destinations include Ayutthaya, Chiang Mai, Hua Hin, Hat Yai and Aranyaprathet for onward travel to Siem Reap, Cambodia. Train travel between Bangkok and Vientiane, Laos is possible by taking the Northern line to Nong Khai and simply walking over the border. Bangkok can also be reached by train from Singapore, Kuala Lumpur and Penang in Malaysia. Travelers who are journeying to Kanchanaburi to visit the “Bridge Over the River Kwai” and related sites will depart from Thornburi Railway Station on the west side of the Chao Phraya river. As a major bus transportation hub, Bangkok has a number of very large bus stations or terminals. Bangkok's largest bus terminal is Mo Chit, often called Chatuchak or the Northern Bus Terminal as it serves northern destinations such as Ayutthaya, Sukhothai and Chiang Mai. Mo Chit terminal is easily accessible by public transportation including buses and the BTS Skytrain System and the MRT metro. Sai Tai Taling Chan is known as the Southern Bus Terminal as it is the departure point for buses traveling to destinations in the country’s south including Hua Hin, Pattaya, Phuket and Krabi and Maeklong for the famous Maeklong Railway Market. It should be noted that all the mini-busses that previously departed from Victory Monument have been relocated to this station. Sai Tai Mai can be reached very inexpensively from Victory Monument by taking the (yellow) number 28 bus. Travelers headed to Pattaya and Rayong can board busses at the Ekamai bus station, conveniently located at the BTS Skytrain Station Ekamai. 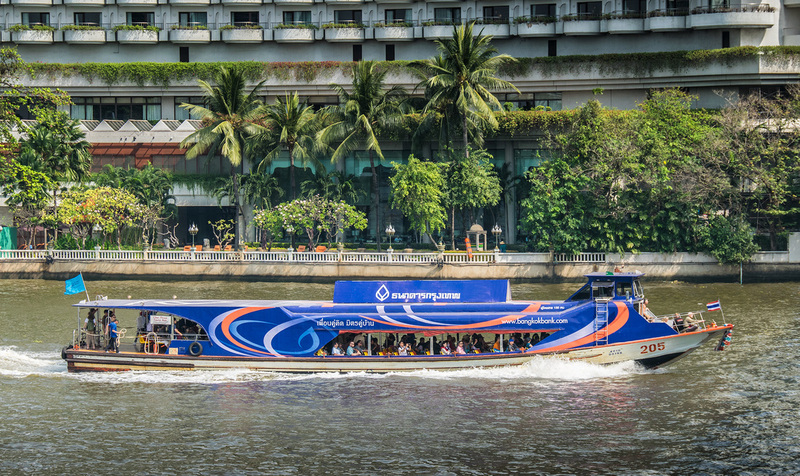 Another fun way to explore Bangkok is to travel by the express boat on the Khlong Saen Seap. Khlong is the Thai word for canal and the Saen Seap is just one of many waterways branching off of the Chao Phraya River. The 11 miles (18 km) of canals that compose this route basically run east to west, starting at Wat Sri Bunruang and ending at the Golden Mount. Golden Mount is a beautiful temple perched high above the city and is a great place to take photographs. Travelers staying in Sukhumvit or shoppers in the Ratchaprasong area will find that using the canal is an extremely inexpensive and convenient way to get to the Jim Thompson House, Democracy Monument and the King Prajadhipok Museum. 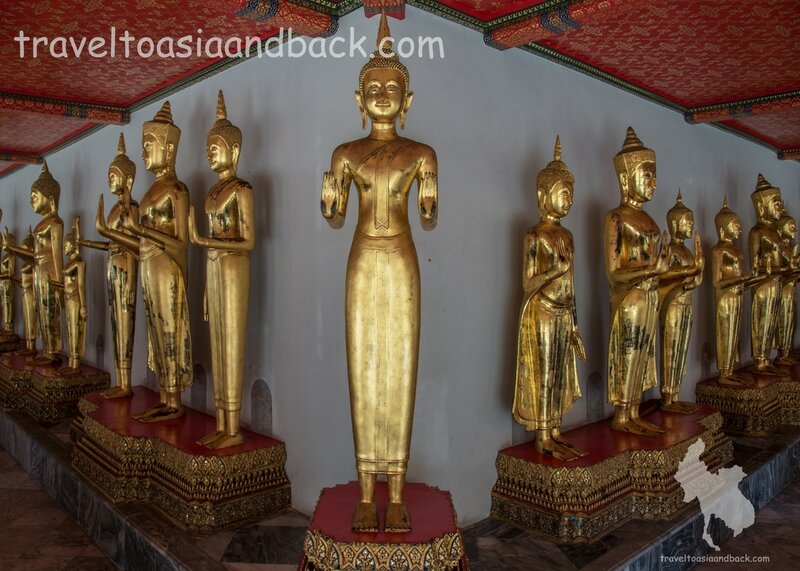 After visiting the Golden Mount it’s very easy to catch a taxi or tuk-tuk to the must-see destinations along the Chao Phraya River. Walking is an option as well, but go in the morning or late afternoon to avoid the hottest hours of the day and please don’t forget to drink plenty of water. 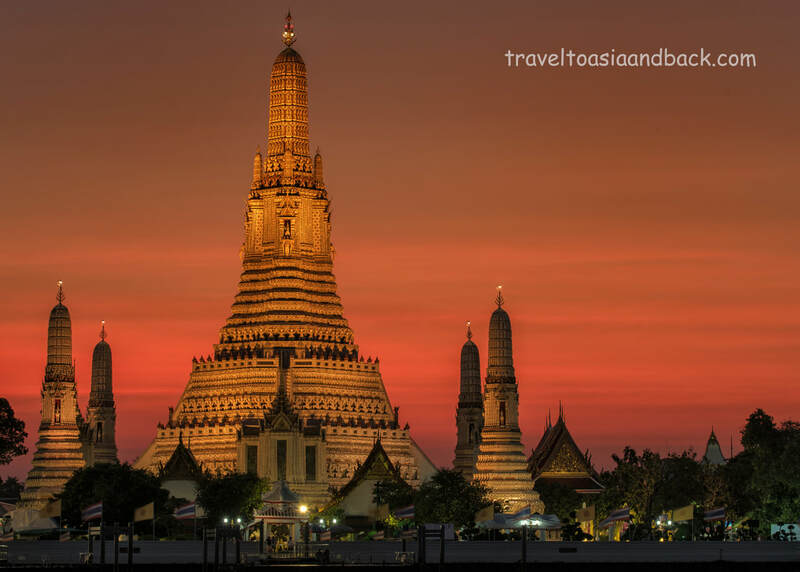 The Grand Palace, Wat Pho, and Wat Arun are all located on (or close to) the Chao Phraya River, a busy waterway which runs through the heart of Bangkok. These temples, Chinatown, the Flower Market, the outdoor mall Asiatique and many other interesting sites can be easily reached by ferryboat. Simply take the BTS Skytrain to Saphan Taksin Station and go out of exit number 2. This will lead you to the Rama VIII bridge which crosses the river. Under the bridge is Sathorn Pier, listed on some maps as Central Pier, the starting point of the Chao Phraya Express & Tourist Boat Services. These boats are really fun to travel on, easy to use and very inexpensive. The southernmost dock at the pier provides boat service to several hotels and the free ferry to Asiatique.